Sometimes you need something simple. Like that one time when at a friend’s bbq party you ate something like 8 ribs, a couple of burgers and 100 honey glazed chicken thighs. No wonder afterwards the dog was trying to bite your calf, he no longer saw you as a human being but rather as a walking sirloin steak. Not like that happened to me or anything lol. Any-hoo, as I was saying, sometimes you need something simple and also light, fresh and nutritious. Something that will make you feel less guilty for all the meat you engorged. Behold people: enters zucchini with basil, mint & lemon. This is quite an unusual side dish to serve at a barbecue — where the potato salad reigns supreme. But trust me, success is guaranteed. It’s terribly simple to make, and it’s fantastic because it’s a nice little side dish that goes great with barbecued meat or fish, but also with other things like mozzarella, goat’s cheese or cured meats. It’s light, green, fresh and so delicious. Prepare zucchini this way just one time and I guarantee you will forget how you did it before. Maybe not. Maybe you will just learn a new way to prepare zucchini, and that’s good enough for me. Look for zucchini that are small to medium in size (the larger ones tend to be watery and less flavorful), consistent in color, and free of soft spots and shriveling. Once you master this quick zucchini recipe, you’ll find lots of great ways to change it up. One of my favorite variations includes adding fresh chiles and pile it on top of sunny-side up eggs. 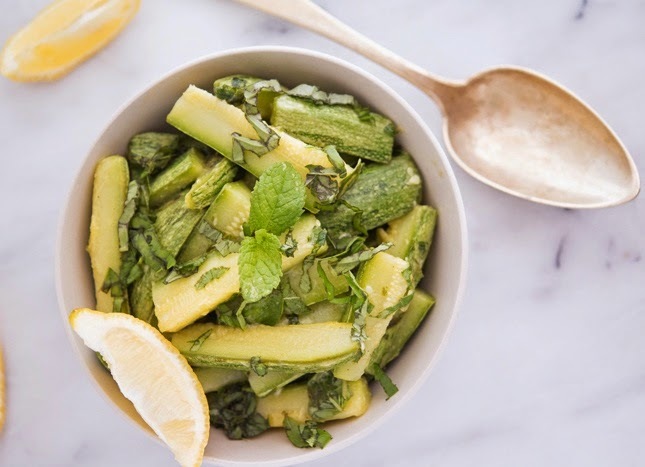 Zucchini with Basil, Mint & Lemon Print this recipe! In a small bowl (or a mason jar) combine lemon juice, olive oil, basil, mint, garlic, salt and pepper. Rinse the zucchini under cold water and cut off the ends. Cut zucchini in half, then cut half into four wedges (you should get 8 wedges per zucchini). Drain in a colander and run under cold water to stop the cooking; drain again. Transfer to a bowl and refrigerate until ready to serve. 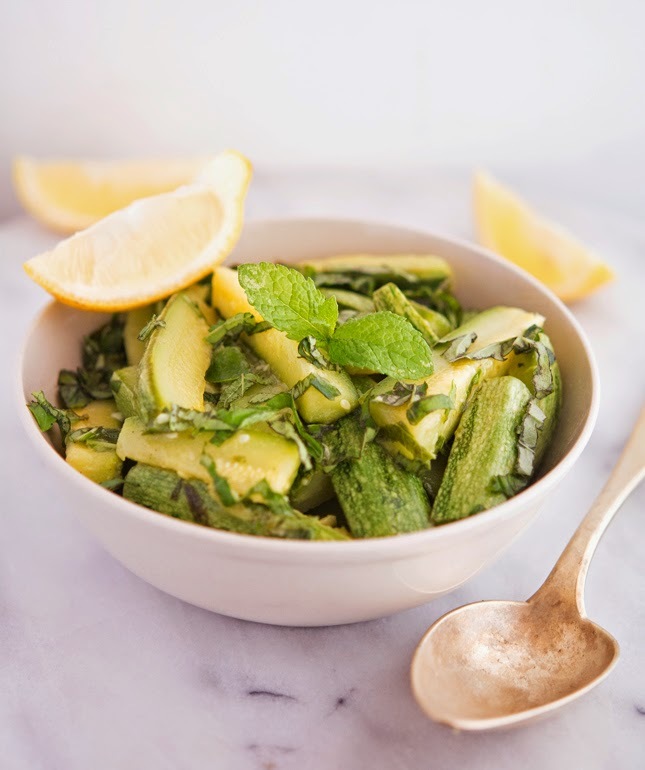 When ready to serve (if the zucchini have released some water while cooling, discard it) pour dressing over zucchini, gently toss, sprinkle with remaining basil and mint and serve. One serving yields 67 calories, 5 grams of fat, 6 grams of carbs and 2 grams of protein. This looks incredible! I have been buying zucchini like crazy and eating it every way imaginable. I'll need to give this a try. Always love a new veggie recipe! My garden is overflowing with mint, so this works out rather nicely. I'd choose this over potato salad any day! Also, when you mentioned the dog seeing you as a sirloin steak, I thought of the Seinfeld episode where Kramer looks like a Turkey to Newman :) hehe. Seinfeld is the best, I still watch it and it still makes me laugh. Such a great show! I love a simple side dish such as this one. Yum! And, the meatballs were amazing. We made them that night for dinner. That's so awesome Lauren, I'm so glad you liked them! This recipe sounds heavenly. I rather like the idea of using a spiral cutter, because for some reason I can't figure, zucchini tastes better to me that way. Looking forward to trying this. I love my spiral cutter, but this time Ia good 'ol knife did the trick as well. Please let me know how you like it, when (and if) you make it! I gotta hand it to you, Mike - you took something simple and made it sound and look pretty spectacular! And thanks for the big vs small zucchini tip! You know what's funny? As soon as I saw this post in the list this morning, I said "ooo, that sounds delicious." Then I saw that it come from you and I knew it must be delicious! Way to help the wolfpack have a more balanced summer picnic! This could be my new favorite breakfast with the sunny-side up egg suggestion and maybe even a spoonful of aioli to guild the lily! Oh yeah Kari, aioli is like the perfect add-on! Hi Mike, love simple dishes, they are always the best. Love the egg version too! I love simple sides like this at backyard grill-outs. Looks great man. And I'm super proud the way you pounded down all that food at your friend's bbq. That's wolfpack style baby! Love simple sides like this at grill-outs. And dude, seriously impressive show of eating at your friend's bbq. That's how the wolfpack rolls! Reading your description of the "day after" a BBQ made me lol! 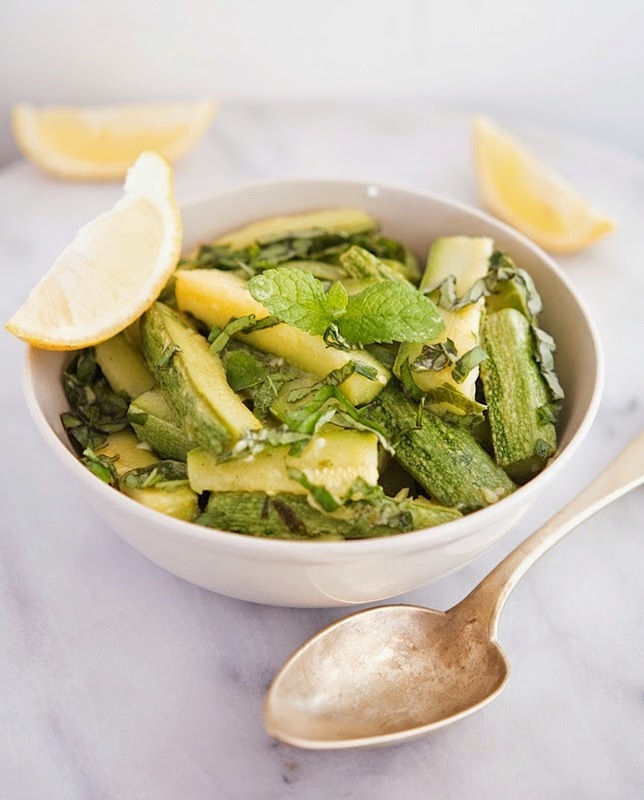 Love this veggie pasta- clean, simple and delicious, perfect to celebrate the warm weather. Was fun looking through your posts...you have some super recipes, Mike. Simple and delicious! Perfect for summer!! It is really perfect for the summer Pepi!